At the same time I etched the LED Firefly prototypes, I did some breadboard ICSP adapters. I've been working with ATtiny13s a lot recently, and they are a pain to program while breadboarding, so these seemed like just the thing. 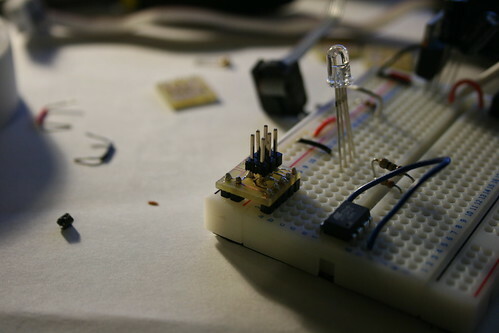 It has a 6pin ICSP plug on top, and connects to the breadboard's power rails and the four pins along one side of the ATtiny13. 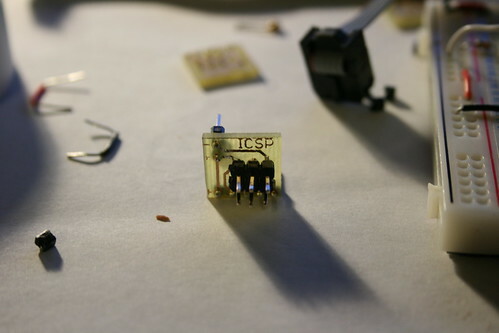 It provides the AVR with +ve power and three of four required ICSP connections. The final pin has to be connected to pin one of the AVR, so the whole PCB reduces ICSP connections down to just one jump wire. It works really nicely from my quick experiments, which is nice!